PRONANOTEX is the exclusive distributor of bluechem products in Southeastern United States. We strive to improve our offerings of bluechem products as they keep evolving to satisfy the growing demands and requirements for safe and effective products for humans and the environment. Yes, bluechem products are eco and environmentally friendly! Whether it’s cars, buses, trucks, tractors, motorcycles, boats (4 stroke or diesel), or a fleet of semi-trailer trucks; bluechem products maintain and extend the life of the engine, clean the fuel & oil systems by removing contaminates, carbon deposits, and as a result, improve fuel efficiency and consequently a better driving experience. Order some products for your shop or store today! Shop owners, if you’re interested, book a demo and we’ll do a head to head demo against whatever you’re using in your shop! Race approved nanotechnology leader in engine care and maintenance. Improve engine performance, improve vehicle utility, extend operating life cycles, increase fuel efficiency, & reduce noxious emissions. High performance additives & system cleaners for 2-stroke, & 4-stroke motorbikes. Use for preventative maintenance & to guarantee the best performance for all motorbike engines. Fuel system cleaners (gas & diesel engines) & oil system cleaners to increase performance, protect your engine, reduce emissions & fuel consumption for your 2 stroke, 4 stroke, as well as small or large diesel engines. Whether it’s gasoline or diesel, commercial or industrial, we have the right products that will save your business money by lowering maintenance costs, improve fuel efficiency, reducing noxious emissions, & maintain optimal performance. bluechem’s powermaxx Fuel System Cleaner is a high performance fuel system cleaner that removes operationally caused contamination in the entire fuel system. Starting from the gas tank, on through the fuel line and into the combustion chambers. It removes resin and stickiness from the carburetor and fuel injection nozzles, as well as removes further carbon residues and soot deposits from the entire upper cylinder area. 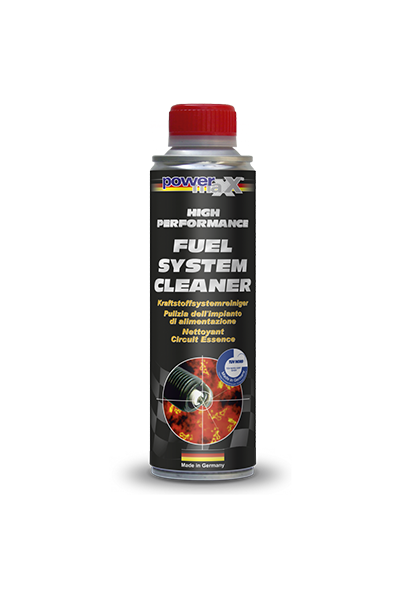 The Fuel System Cleaner is not a typical flush, nano particles breaks down the carbon & deposits on a molecular level and then ejected through the exhaust system. Humidity & water are also eliminated from the fuel system. The water binds with the Fuel System Cleaner and then burns out as a smooth stable combustible emulsion via the exhaust, and at the same time lubricates and protects the upper cylinder area. More power, reduced emissions, and improves fuel efficiency. Highly recommended for use in conjunction with the Oil System Cleaner before or after the oil change. Motor vehicles, buses, tractors, semi-trailer trucks, motorcycles, and any other high performance engines that uses unleaded gasoline. (e.g., ships and boats, racing motors, etc. even Go-Karts and lawn mowers). Pour into the fuel tank when it’s a quarter or less empty and then fill up with gasoline. This product is sensor and filter safe. If spilled onto paintwork surfaces, rinse off immediately with clean water. The Fuel System Cleaner is not a fuel back-up; it burns with the fuel and is ejected out the exhaust system. 300 ml poured into a quarter empty fuel tank and then fill up with fuel. 300 ml will work well up to a 20 gallon gas tank. bluechem’s Powermaxx Oil System Cleaner is a High Performance engine oil system cleaner that removes operational contamination and resin deposits in the entire oil and lubricating system. More Power and Energy for all gasoline and diesel engines, gearboxes and differentials. More power, less emissions, less consumption, more effieciency and as a result a better driving experience. 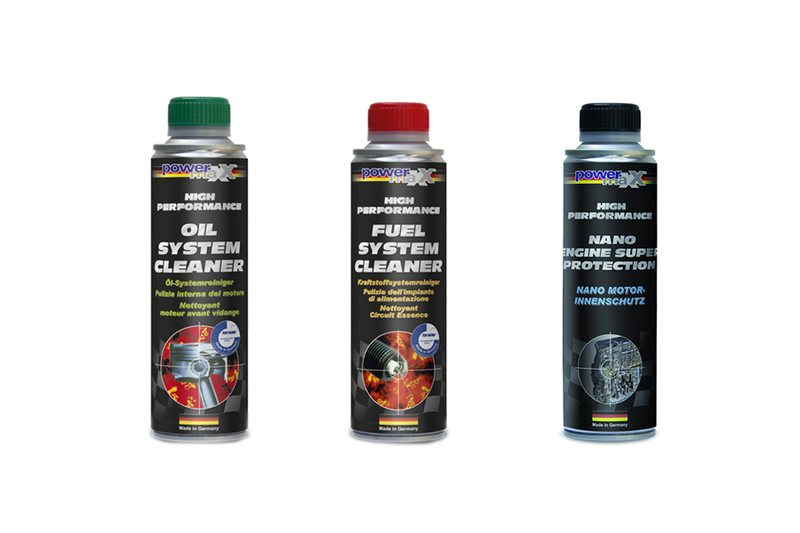 Order some powermaxx Oil System Cleaner from PRONANOTEX today! bluechem’s powermaxx Nano Engine Super Protection creates a highly active nano barrier in the oil that protects the internal parts of engines, transmissions, differentials or anywhere there is metal to metal contact by creating a nano barrier that reduces friction and heat which would otherwise cause premature wear on these components. Seals and O rings are kept supple; quickest oil flow during cold starts, smoother, softer engine running, improved performance, longer life of aggregates, and excellent emergency running is achieved by using Nano Engine Super Protection. Additional Power, Efficiency and Wear protection, and Ultimately a smooth and quite engine. Order some powermaxx Nano Engine Super Protection from PRONANOTEX today! Just add a can to the oil system right directly after an oil change. We highly recommend doing an oil system clean with the Oil System Cleaner before using this product. Please observe the total Oil capacity according to manufacturer specifications. Also can be used for power steering, gearbox and differentials, the mixing ration is 1:10. Please fill out the contact form if you’re interested in bluechem product information and/or to schedule a bluechem demo for your shop or business.